We offer a large selection of single origin, delicious and healthy range of chocolate bars and tablets. For no sugar we offer two carefully selected organic 100% chocolates from famous cocoa growing regions both in bar and tablet form. Classic chocolate bars with an important difference: each pack contains two bars of instead of the usual one. We've gone the extra mile to give you two thin bars instead of a thick one. This helps you to make the most of your chocolate experience while still enjoying this classic chocolate presentation.Choose from our range of chocolate bars:100 Madagascar*: This chocolate is a rare find. Light, fruity, brings up memories of cantaloupes, it finishes with a strong, slightly bitter taste - just to remind you, that this is a serious no-sugar, pure, 100% chocolate.100% Dominica*: For people who love serious chocolate. These tablets made of 100% Dominican dark chocolate will give you complex flavours with olive, nutty, and vegetal notes. Long lasting cocoa finish.85% Colombia: With 85% cocoa content, this is a strong chocolate. Yet it is surprisingly sweet and easy to enjoy. It starts with vanilla flavours, releasing darker molasses, and finishing with woody notes. (Contains soya lecithin)82% Dominica*: A mild and creamy chocolate, with hints of olives. An earthy, well balanced chocolate with a light, honey-like finish. 76% Brasil*: This Brazilian 76% single origin organic dark chocolate will take you on an exciting journey through tropical fruit notes, with hints of cinnamon, melon and strawberry.75% Tanzania: Chocolaty, with a mousse-like creaminess. Slight acidity, developing darker, bread-like tones. 72% Venezuela: Dark chocolate with almond sweetness, developing floral notes, then a touch of citrus. (Contains soya lecithin)71% Nicaragua: Complex, strong hints of liquorice and lemon sherbet. Cherry and berry tones.40% Madagascar, Cashew Milk: Non-dairy "milk" chocolate made with cashew nuts. Sweet, chocolatey and creamy, with soft nutty tones. A great milk chocolate alternative. Contains nuts.Each pack contains 2 bars.Pack size: 120 x 50 x 10 mm, weight 56 g. In compostable packaging.Vegan, dairy free, *Denotes organic. Allergen in boldMulti-buy options available, discounts from 4 to 13% depending on the number of packs you buy. Free UK standard delivery when buying 4 packs or more.Buying more than one pack and want more than one flavour? Please choose the number of packs first, then your first flavour from the drop-down menu. Please list the rest of the flavours in the "Message" section below it. All chocolates are not created equal. They are just as complex as wine or coffee, maybe even more so. The original flavour and quality of the cocoa beans, as well as the treatment they receive at each step in the making has a profound influence on the flavour and texture of the finished chocolate.Good chocolate will fill you with joy, and deserves attention. Take one of the tablets from your box, break it into smaller pieces. Put a piece on your tongue, and allow it to melt and coat your mouth. 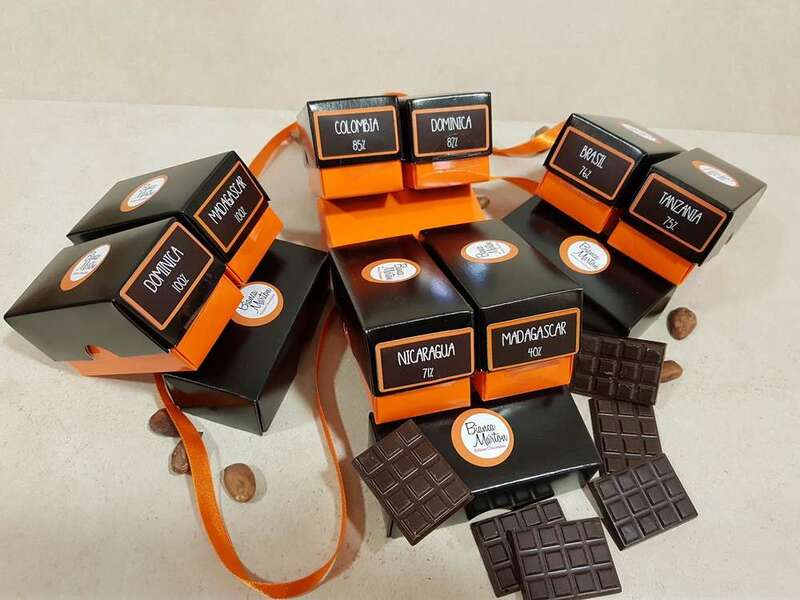 The aromas will fill the back of your nose - all the while taking you for a journey through the developing flavours.Our range offers chocolates from different growing regions at different % cocoa content:100 Madagascar*: This chocolate is a rare find. Light, fruity, brings up memories of cantaloupes, it finishes with a strong, slightly bitter taste - just to remind you, that this is a serious no-sugar, pure, 100% chocolate.100% Dominica*: For people who love serious chocolate. These tablets made of 100% Dominican dark chocolate will give you complex flavours with olive, nutty, and vegetal notes. Long lasting cocoa finish.85% Colombia: With 85% cocoa content, this is a strong chocolate. Yet it is surprisingly sweet and easy to enjoy. It starts with vanilla flavours, releasing darker molasses, and finishing with woody notes. (Contains soya lecithin)82% Dominica*: A mild and creamy chocolate, with hints of olives. An earthy, well balanced chocolate with a light, honey-like finish. 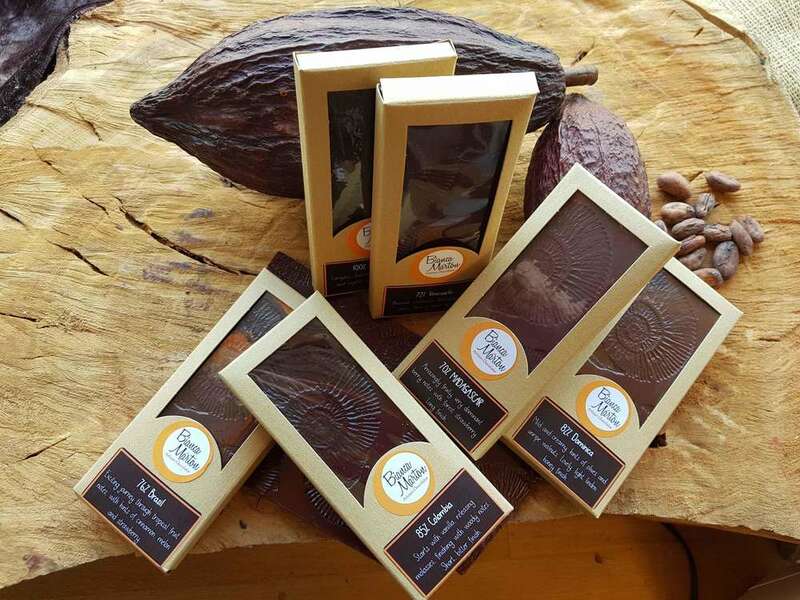 76% Brasil*: This Brazilian 76% single origin organic dark chocolate will take you on an exciting journey through tropical fruit notes, with hints of cinnamon, melon and strawberry.75% Tanzania: Chocolaty, with a mousse-like creaminess. Slight acidity, developing darker, bread-like tones. 72% Venezuela: Dark chocolate with almond sweetness, developing floral notes, then a touch of citrus. (Contains soya lecithin)71% Nicaragua: Complex, strong hints of liquorice and lemon sherbet. Cherry and berry tones.40% Madagascar, Cashew Milk: A non-dairy "milk" chocolate made with cashew nuts. Sweet, chocolatey and creamy, with soft nutty tones. A great milk chocolate alternative. Contains nuts. Vegan, dairy free, *Denotes organic. Allergen in boldBox measures 78 x 41 x 32 mm. Min. net weight 70 g. Multi-buy options available, discounts from 4 to 11% depending on the number of boxes you buy. Free UK standard delivery when buying 3 boxes or more.Buying more than one box and want more than one flavour? Please choose the number of boxes first, then your first flavour from the drop-down menu. Please list the rest of the flavours in the "Message" section below it.